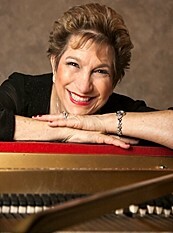 Carol Stein returns to The Winter Park Playhouse Spotlight Cabaret Series with her latest exciting solo cabaret, Accentuate The Positive! Carol always tries to look on "The Bright Side of Life" so come share an evening of musical optimism! Playhouse patrons will remember Ms. Stein from her last cabaret, Moonlight Madness, and her many cabaret appearances here at The Playhouse. These popular cabarets sell out quickly so get your tickets today!